Born in 1983 in Paiporta (Valencia-Spain), Beatriz Fernández Aucejo, graduated in the speciality of clarinet at the Conservatorio Superior de Valencia “Joaquín Rodrigo” and in Musical Teaching at the Universidad de Valencia “Ausiàs March”. She has a professional title in the speciality of piano at the Conservatorio Profesional de Música de Torrent. She is also qualified in the speciality of conducting of wind orchestra at the Royal School of Music (LRSM), and she is qualified in the speciality of conducting of orchestra at the Conservatorio Superior de Música de Murcia. Within the specialty of conduction, and despite her youth, Beatriz Fernández has been invited conductor of the Banda Sinfónica de la Societat Musical Recreativa de Carcaixent, Banda Primitiva de Paiporta, Ateneu Musical del Port de Valencia, Unió Musical de Montserrat, Unió Musical de Torrent, Lira Castellonera de Villanova de Castelló, among others. She has been chief conductor of the Societat Musical La Lira de Vilafamés, Banda Associació Cultural Allegro de València, getting different awards in which he has participated, and Societat Musical L’Artesana de Catarroja, receiving two honorable mentions. 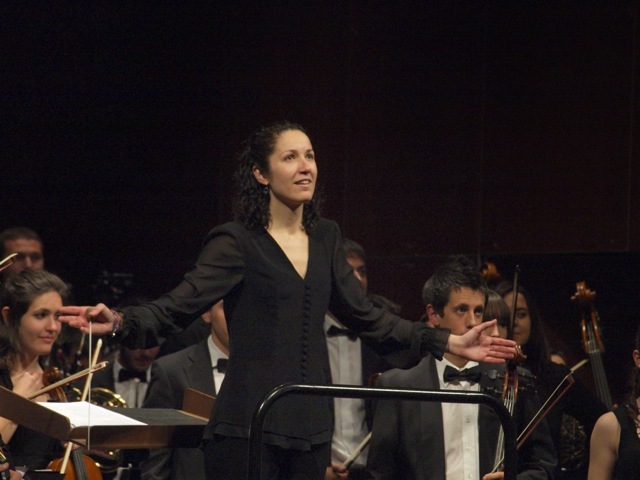 She is currently Chief Conductor of the Banda Unión Musical de Carlet and Banda “Lira Castellonera” de Villanova de Castelló. In the speciality of Orchestral Conducting, she has studied development classes with the teacher Ferrer Ferran, Cristóbal Soler, José Miguel Rodilla, Ernesto Izquierdo, Manuel Galduf, Jose Mª Cervera Collado, Enrique Garcia Asensio, Bruno Aprea, Peter Gülke, Yaron Traub, Joshard Daus, George Pehlivanian, Rodolfo Saglimbeni, among others. She has conducted the Orquestra del Conservatori Superior Masotti Little of Múrcia, Jove Orquestra Simfònica de Galícia, Orquestra Ciutat de Torrent, Orquestra MendelssohnSymphonia and Cor Europa ChorAcademie d’Alemanya, Deutsche Kammerakademie Neuss am Rhein, Orquestra Filharmónica de la Universitat de València and Jove Orquestra de la Generalitat Valenciana (JORGV), occupying the square of Assistant Conductor in these last two, beside the masters Cristóbal Soler and Manuel Galduf, respectively, during the last years. She is currently Chief Conductor of the orchestra Ateneo Musical del Port de Valencia. He was part as jury the the Certamen Provincial de Banda in Valencia, Castellón and Alicante in 2013, in addition to the Certamen de la Comunidad in 2012 and 2013. She has been recently has been awarded with the prize Isabel Ferrer of the Generalitat Valenciana, as his appointment as Artistic-Musical Conductor of the Jove Banda Simfònica of the FSMCV for the year 2015.